Commercial Fisheries Director Sam Rabung is a lifelong Alaskan who has worked in salmon fisheries enhancement and mariculture in Alaska for more than 35 years. 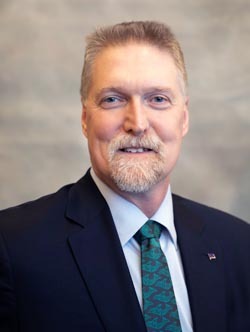 Before taking his current position, Sam was the Section Chief of Statewide Aquaculture Planning and Permitting for Commercial Fisheries and was responsible for oversight of Alaska's Private Nonprofit (PNP) Salmon Hatchery program, Aquatic Farm permitting, and fish transport and propagative research permitting. He is a voting member on all Regional Planning Teams statewide and a member of the Mariculture Task Force. He has worked for USFWS, ADF&G, and Alaskan regional and non-regional aquaculture associations at over 14 hatchery facilities in positions ranging from Technician to General Manager. He has experience working in mariculture as a student researching kelp culture, as part of a cooperative kelp mariculture training program in Japan, and through working with oysters on permitted Aquatic Farms in Alaska. Rabung graduated with honors in 1987 from Sheldon Jackson College with a B.S., in Aquatic Resources, Fisheries Science and Aquaculture Emphasis. He attended A.J. Dimond High School in Anchorage, where he graduated in 1982.